Adam spends the day walking around the forest, thinking about it and his life with his parents and his dog Miro before the war and the ghetto. His mother doesn’t return that evening. The next day, Adam meets Thomas, also 9, and also left in the forest by his mother with the same promise to return for him in the evening. Adam and Thomas know each other from school, though they had not been friends there. They spend the day in the forest, and that evening, their mothers again fail to return. By day, Adam and Thomas forage in the forest for food, and talk to each other about their situation. Their talks begin to take on a philosophical nature, about faith, God. and intellect. Positive thinker Adam believes God will help get them through, negative thinker Thomas relies of study and education, which isn’t happening for him now. Adam and Thomas decide to build a nest in a high tree for safety, partly because of the fugitives running through the forest, pursued by Nazis shooting at them. They both understand they will also be shot if found since they are Jewish. Every day. the two boys wait for their mothers, who never come for them. One day, however, while trying to help a wounded man attempting to escape the Nazis, they learn that the ghetto has been liquidated and everyone sent to Poland. Luckily, they also discover a cow in a meadow and begin to get some milk from her every day. One day, a young girl their age comes to milk the cow. It is also a girl from their class named Mina. Mina is hiding from the Nazis in a peasant’s home. After the boys try to make contact with her, Mina begins to leave food for them whenever she can. Days turn into weeks and weeks turn into months, and soon a kind peasant tells them the Red Army is not far away, the war could be ending, and, meanwhile, he also begins to leave food for the boys. Then, one day, out of the blue, Adam’s dog shows up with a note from his mother attached to the underside of his collar. The weather begins to get colder and colder and soon, snow starts falling. One day, the boys see a figure wading through the ever deepening snow, and realize it is Mina, who has been very badly beaten by the peasant she lived with and thrown out into the cold and snow. How will the children survive the cold harsh winter, with only small amounts of food and no real shelter, and not even a fire to warm themselves by. And can two young boys really nurse Mina back to health, or will it take a miracle to make that happen? I have to admit that I found Adam & Thomas to be a bit of a strange story. It was originally written in Hebrew and loosely based on author Aharon Appelfeld's real life experiences. It is also his first book for children. The philosophical conversations between Adam and Thomas aren't so deep or adult that middle grade readers won't understand them, but they may be a bit disconcerting, since it isn't something young readers may be used to. But there are not explanations for some things (like why was Mina beaten? And there is no closure to anything, including the ending). That aside, Adam & Thomas is a compelling story about suffering, survival, optimism, friendship, and especially acts of kindness during some very dark, difficult days. Appelfeld's writing is clear and simple, with short declarative sentences and few adjectives for the most part. The story of the two boys, including the animals and people they encounter, has a unrealistic quality to it. 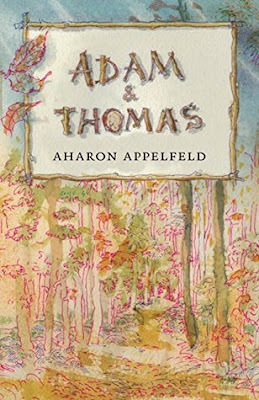 Appelfeld says he writes from a dreamlike or artificial/imitative-like world in the kind of style used in the Bible, all of which, I think, is what gives Adam & Thomas its fable-like feeling. But make no doubt about it, this is a story based on truth, on horrific circumstances and you never forget that while reading. Adults and young readers interested in the Holocaust shouldn't miss this small but totally accessible and powerful book, which, I think, will also make an big impact on readers not particularly interested in WWII or the Holocaust. I have not heard of this one, but I am always on the lookout for books appropriate for 5th grades that take place during this time period, as the 5th graders do a unit on it at the end of the year. I have passed on your blog to my former grade 5 colleagues (now that I am in the library). This sounds like a book I will have to check out. It does sound different and powerful. The fact that it is based on real life experiences makes me very curious about it. Thanks for sharing!